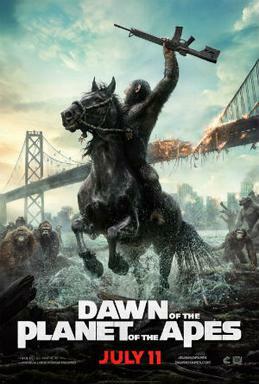 “Dawn of the Planet of the Apes” is the second film in the recent Planet of the Apes reboot franchise. The plot is set 10 years after the first film, “Rise of the Planet of the Apes”. The intelligent apes have formed a colony in the forests outside San Francisco, while humanity has been almost wiped out by an epidemic which started when the apes escaped the laboratory where mad scientists kept them prisoners. When a group of heavily armed human survivors return to SF, the stage is set for a bloody conflict. Soon, both apes and humans split into factions, for or against a war. The ape leader Caesar wants peace, while his rival Koba opts for the destruction of humanity. “Dawn” isn't particularly interesting or good, and feels illogical on a number of levels. Only two stars for this production.